Israel Prisons Service said on Monday that a Palestinian prisoner who has been on hunger strike for more than 80 days, had ended his protest, but Palestinian sources, including his lawyer, denied the claim. "(Mahmud) Sarsak ended his hunger strike," IPS spokeswoman Sivan Weizman told AFP, saying he had taken the decision to end his fast after consulting his lawyer and the prison administration. But Sarsak's family in Gaza, as well as the Palestinian Prisoners' Club in Ramallah, denied that he had ended his strike. And his lawyer, Mohammed Jabarin, said he had no comment on the Israeli claim. 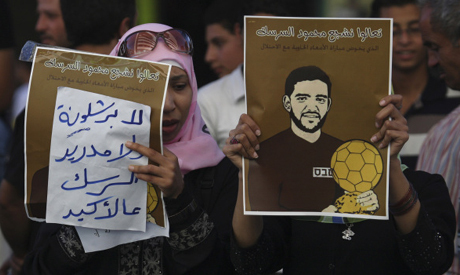 Weizman said Sarsak, who is being held in the infirmary wing at Ramle prison, gave no reason for ending his hunger strike, and said his health was being monitored as he gradually started eating again. He and others also sought an end to the practice of holding suspects in administrative detention, under which a military court can order an individual held without charge for renewable periods of six months.